Excerpt from the November 2016 Washington Institute for Near East Policy (WINEP) report "Beyond Syria and Iraq: Examining Islamic State Provinces." This is a prepared statement delivered by the author to a WINEP conference on the Islamic State in June 2016. 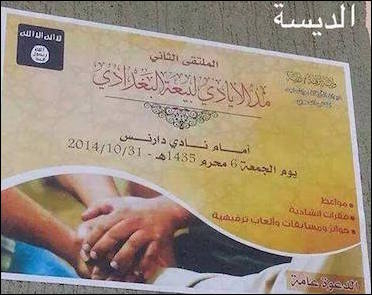 An Islamic State da'wah (religious outreach) billboard in Derna, Libya, October 2014. That the Islamic State presents itself as a state project should by now be a familiar notion, and within the "central" provinces (wilayat) of IS in Iraq and Syria, the project has achieved its most sophisticated stage in the realization of a governance system foremost embodied by diwans (departments), responsible for various aspects of administration, which emerged following the announcement of the Caliphate on June 29, 2014. The Diwan al-Taalim, for instance, is responsible for the education system, managing schools and devising the curriculum to be taught. It also oversees the provision of public services, such as water supplies and road maintenance, while the Diwan al-Hisba takes on a variety of other interesting functions, including the enforcement of Islamic morality in public, consumer protection, and even the granting of permits for people to leave IS territory temporarily. The functions of diwans may overlap at times; thus, regulation of Internet use may fall to both the Diwan al-Hisba and Diwan al-Amn. That said, not every bureaucratic body is known as a diwan. The Hijra Committee, for example, oversees the arrival of new migrants to IS—even providing financial assistance for those who cannot meet expenses but know someone within IS who can vouch for them—as well as managing IS border crossings, such as in the northern Aleppo countryside village of Dabiq, through which businessmen and drivers can visit IS territory for a limited time. Dabiq is better known for being featured in apocalyptic Islamic State propaganda as a showdown site between IS and the West, and has an IS magazine named for it. The existence of the IS administrative bodies is hardly unprecedented, at least on paper. The first incarnation of IS's predecessors who claimed to be a state—the Islamic State of Iraq (ISI), declared in October 2006—had two cabinets of government ministries, the first announced in 2007 and the second in 2009. These cabinets included some ministries overlapping with the present-day diwans, such as ministries for oil, health, and public security. In practice, however, these ISI ministries amounted to little in terms of governance, even though documentary evidence emerging from the period shows a developed internal bureaucracy and criminal organization adept at generating revenue within areas of operation, as well as limited dependence on foreign donors. Indeed, the limitations in governance were acknowledged by ISI itself, in a treatise the group published by Sharia Committees head Abu Othman al-Tamimi, titled "Informing the People about the Birth of the Islamic State of Iraq," which invoked the precedent of the Prophet, whose enemies far exceeded him in knowledge and capabilities when he set up his first state entity following the hijra to Medina. As part of its claim to be the Caliphate, demanding the allegiance of the world's Muslims and desiring the conquest of the entire world, IS has sought to expand beyond Iraq and Syria, giving an impression of territorial control. This impression is most apparent in the declaration of official affiliates in the form of new wilayat, deriving from declarations of allegiance to IS from the areas in question. The Middle East and North Africa region was the target of the first major wave of IS expansion announced in November 2014, with wilayat declared in Sinai, Libya, Algeria, Bilad al-Haramayn (Saudi Arabia), and Yemen. As the sites of official provinces of IS, one might expect these areas to display signs of IS governance, mimicking the system in Iraq and Syria. In fact, the picture suggests realization of IS governance in these provinces is limited; the most successful initiative so far has been in Libya, but, even there, IS's fortunes have varied over time. Lack of contiguous territorial control has been a significant obstacle to IS governance beyond Iraq and Syria. Generally speaking, a significant obstacle to the realization of IS governance in the provinces beyond Iraq and Syria has been the lack of real and contiguous territorial control. For comparison, note that IS governance in Iraq and Syria gradually became more complex. With the development in Syria of a network of strongholds and contiguous territory over the first half of 2014, centered on the city of Raqqa, and then with the seizure of Mosul and other cities in Iraq in June 2014, the territory came to span the borders and served as an important basis for the caliphate declaration. In at least two of the IS provinces, however—the Algeria province (Wilayat al-Jazair) and Bilad al-Haramayn (Wilayat Nejd, Wilayat al-Hejaz, and Wilayat al-Bahrain)—one cannot seriously speak of any real territorial control, and it is doubtful the original motivation behind accepting allegiance pledges to form these provinces could be seen as achieving territorial control and implementing governance. 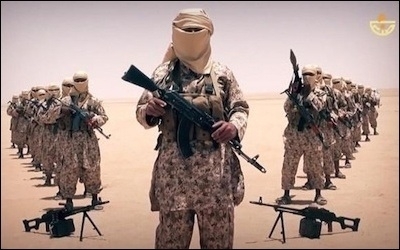 Rather, the Algeria province primarily seems to have symbolic value as a renowned historic arena of jihad, besides presenting a chance to poach affiliates of al-Qaeda in the Islamic Maghreb (AQIM). Only very sporadic reports emerge of IS activity in Algeria, mostly relating to attacks on the Algerian army. The importance of Bilad al-Haramayn, of course, lies in its being home to the two holiest sites in Islam at Mecca and Medina. While IS has carried out a number of attacks in Saudi Arabia and expanded the scope of operations into Kuwait, claiming a suicide bombing there targeting Shiites, this points only to the existence of terrorist cells, not territorial control or governance. 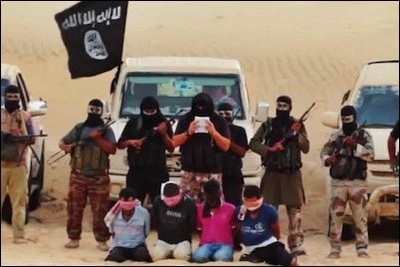 Ansar Bayt al-Maqdis terrorists preparing to decapitate alleged Mossad spies in Sinai, 2014. A more developed case, though not approaching a meaningful level of governance comparable to Iraq and Syria, is that of IS Sinai, which evolved from the pledge of allegiance of Ansar Beit al-Maqdis (Supporters of the Holy House). The Sinai affiliate has been able to conduct a number of hardhitting attacks targeting the Egyptian security forces, and it placed the bomb that downed a Russian airliner taking off from the Sharm al-Sheikh resort. The Sinai affiliate controls no major strongholds or significant contiguous territory in the peninsula, however. Documentary evidence mainly points to its distributing statements to the local population, such as warnings against cooperation with the Sisi regime or such-and-such individual on the grounds that he works with the regime, rather than administrative documents such as one sees from Iraq and Syria. Meanwhile, the Sinai media wing mostly advertises military operations and executions of spies, only occasionally featuring governance in what might be deemed proto-hisba activity, with the Hisba Department and Islamic police confiscating and destroying illicit goods like cigarettes and drugs. A more recent photo series also featured a medical clinic, but the exact location was not given, and it seems probable it is a facility set up to provide treatment for the Sinai affiliate's own fighters. The situation in Yemen arguably provided an ideal environment for the growth of IS, with the chaotic conditions of a civil war and Sunni-Shiite sectarian tensions culminating in the takeover of the capital, Sana, by the Zaidi Shiite Ansar Allah (Houthi) movement, which is supported by Iran. In addition, one could read an October 2014 statement by al-Qaeda in the Arabian Peninsula (AQAP) as sympathetic to IS in its denunciation of the idea that the latter was a movement of khawarij (Kharijites, referring to a sect in early Islamic history renowned for extremism) and its call for solidarity in the face of the coalition alliance against IS. This statement might have led IS to believe it could win over elements within AQAP to develop affiliates in Yemen. An April 2015 ISIS propaganda video shows Yemeni militants in matching uniforms pledging their allegiance (and vowing to kill Houthis). For at least three months after the official declaration of Yemen as part of the IS provinces, however, there was no evidence of IS activity there; then statements began to be distributed in the name of various IS provinces within Yemen, primarily making clear the intent to target Houthis with mass attacks. This was also a theme in the IS nashid (hymn), "Oh Son of Yemen." The evidence for IS governance in Yemen is limited, and it appears the fortunes of the IS affiliates in this regard were likely hurt considerably by internal dissent that came to light in December 2015, when dozens of members, including several high-ranking officials, rejected the overall wali appointed by IS over Yemen. This ultimately led to an intervention by the IS Distant Provinces Administration, which expelled from the ranks those perceived to be the ringleaders of the conspiracy, with a further statement expelling those who persisted in their dissent. How many abandoned their dissent is not clear. As with the Sinai affiliate, the advertised material mainly points to military operations—which have also targeted the Persian Gulf–led coalition forces, particularly in the southern port city of Aden. From Aden, documentary evidence also points to attempts by IS members to impose Islamic law, but the evidence is poorly crafted and amateurish. Also as in the Sinai, a photo series emerged of a medical clinic, supposedly under the Diwan alSiha, but this clinic actually appears to be meant for the treatment of IS fighters. Thus, IS administrative structures that exist in Yemen mainly seem directed toward internal management of the ranks, rather than governance over the population. The remaining case to consider is that of Libya, which has seen much more successful IS governance develop than the other affiliates in the Middle East and North Africa. Originally, IS governance in Libya was concentrated in the city of Darnah in eastern Libya, which, to be sure, was never controlled entirely by IS. This administration developed out of a pledge of allegiance to IS by a local jihadist group called Majlis Shura Shabab al-Islam, which moved quickly in October 2014 to set up institutions in Darnah mimicking the IS bureaucratic system in Iraq and Syria, such as an Islamic court and Diwan al-Hisba, under the moniker of "Cyrenaica province." A Diwan al-Taalim branch also emerged in the area, and documentary evidence attests to the existence of a Diwan al-Dawa wa al-Masajid (responsible for religious outreach and control of the affairs of mosques). This presence in Darnah city was destroyed, however, in June 2015 by the Mujahedin Shura Council of Darnah and Its Suburbs, which is linked to al-Qaeda; and since then, IS has been unable to reclaim a foothold in the city. Islamic State governance in Sirte, Libya, is more sophisticated than anyplace outside of Syria and Iraq. Further out to the west, IS has been able to consolidate territory on the Mediterranean coastline based around the city of Sirte, which, unlike Darnah, is a true stronghold of IS, falling under its Wilayat Tarabulus (Tripoli province), while the easternmost towns on that stretch of territory are defined as part of Cyrenaica province. In part, the dominance of IS in the Sirte area originated in the defection to it of local Libya Ansar al-Sharia networks that had already been involved heavily in governance, going as far back as June 2013. 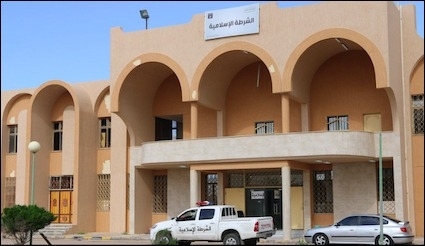 Considerable documentary evidence points to a sophisticated governance system in the Sirte area along the lines of what is observed in Syria and Iraq, including a functioning judiciary (Diwan al-Qada wa al-Mazalim) that deals with matters ranging from marriage contracts to real estate; an Islamic police force; a Dawa and Masajid branch responsible for outreach to the population and control of the affairs of the mosques; repentance programs and sharia sessions as part of a cooptation of local personnel structures; conciliation initiatives; and the introduction of the zakat taxation system (falling under the Diwan al-Zakat wa al-Sadaqat). Islamic State's Diwan al-Hisbah (Islamic Police) office in Sirte, November 2015. The Sirte area, therefore, represents the most developed IS governance project outside of Iraq and Syria; it is thus hardly surprising that Adnani mentioned the city alongside Mosul and Raqqa in a speech released in late May 2016 that partly attempted to hit back at the coalition's claims of progress against IS on account of territorial losses. Indeed, IS control of the Sirte area is coming into doubt in the face of rival local forces beginning to direct their efforts against it. Elsewhere in Libya, IS has found itself a military combatant in Benghazi against forces loyal to Khalifa al-Haftar, while a more covert presence was maintained in Sabratha, to the west of Tripoli city, as part of the running of a suspected training camp for militants, only to be targeted by U.S. airstrikes in February 2016. Meanwhile, the Fezzan province that represents Libya's third major region has shown no sign of governance projects, and, as with Algeria province, information has been very sporadic. In short, IS's ability to realize governance (tamkin) has been very limited thus far in the wider region beyond Iraq and Syria—an observation that has implications for IS's credibility on the global stage, particularly in appealing for support from the wider jihadist movement. Since IS puts such great emphasis on being a state, the lack of success in replicating elsewhere its administration in Iraq and Syria may hurt its appeal in the long run. This absence of effective governing initiatives may also have affected the central leadership's calculations in terms of willingness to declare new wilayat. Although operations have been officially claimed in both Somalia and Tunisia, for instance, IS notably has not declared a province in either of these places, perhaps because the central leadership realizes a failure to show its development as a state rather than just a terrorist threat will make the declaration of new provinces seem like little more than cheap propaganda ploys.